It's certainly possible that there are places selling unregistered orchid crosses, but I like the idea that someone in the Illowa Orchid Society might be breeding their own Paphiopedilums. Of course I would like that idea, I suppose. But it doesn't seem so far-fetched. 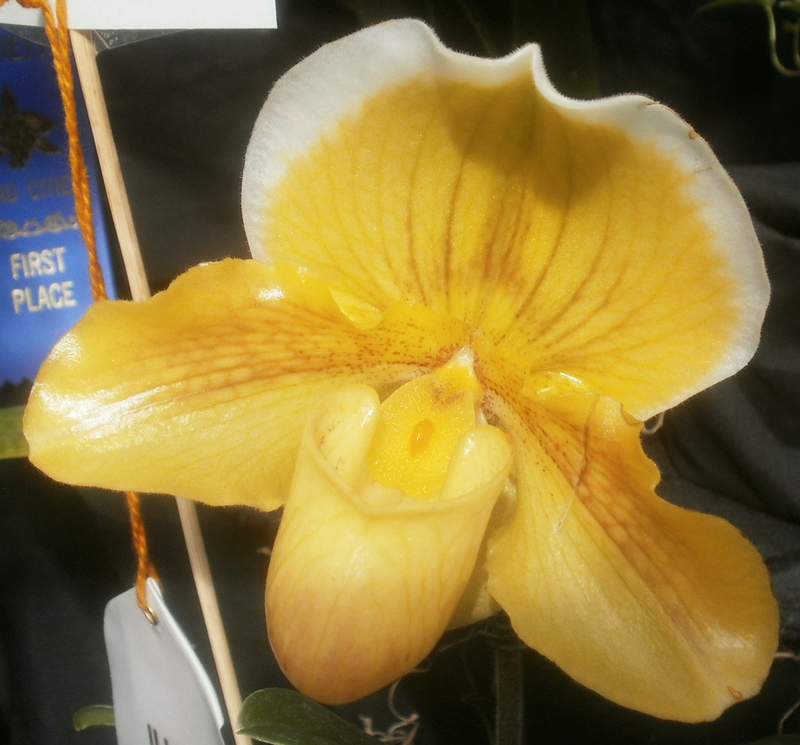 Orchid-flasking services exist, and Paphiopedilum is one of the genera they'll flask, so maybe? I mean, who uses flasking services, if not the people who like orchids so much that they enter them in shows, right? In any case, whether one of the orchid show folks created it themselves or purchased it, I like this bloom. I think it's the white stripe across the top that clinches it for me. I think that might be my favourite out of all the Paphiopedilums I've seen. It looks so cheerful. Both are quite possible. Unregistered hybrids can, indeed, be purchased (often for significantly less than registered ones). But it also is not beyond the pale that someone in that os has tried their hand at paph breeding.